After reading my Aeon essay on the topic, a representative from a San Francisco startup called YONDR contacted me. 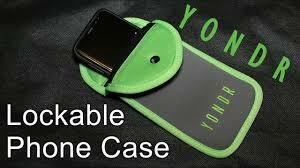 YONDR makes special pouches that keep audiences from using their phones at shows. You silence your phone, slide it into the pouch, and lock it at the top. After the performance, or if access is necessary before then, you can unlock the case in the lobby by touching the lock to a metal base, similar to anti-theft tags on clothing. Performers such as Dave Chappelle and Alicia Keys have used YONDR – whose motto is 'Be here now' – to curtail unsanctioned recordings and, when they look into the crowd, they see faces, not phones. The approach seems less draconian than forcing people to part with their tech, as separation anxiety defeats the goal of increased engagement.